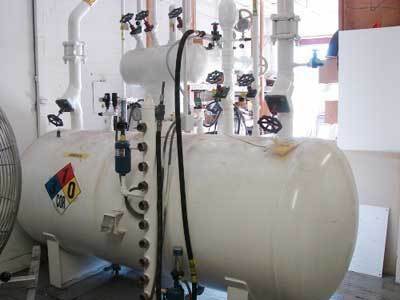 We are identified as one of the prominent Ammonia Receiver Manufacturers in India. The Ammonia Receiver offered by us is fabricated using high grade raw materials that assure high strength and durability to the structure. We conduct stringent checking of Ammonia Receiver on the various parameters and testing on1000 lbs. per square inch hydraulic pressure. Our Ammonia Receiver is attached with stands, valves, and various other standard fittings. Manufactor and supplier of turnkey projects for ammonia ice plant, cold storages, milk chilling plants equipments and compresors spares. 31p/7b Street No 4, G Anand Parvat, New Rohtak Road.